“Celebrating Freedoms, Honoring Veterans” was the theme of the 3rd annual Lincoln Dinner held April 17 at the Concordia Community Center. 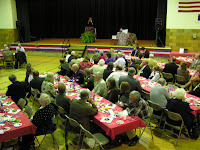 The Lafayette County Republican Central Committee sponsored the event that drew more than 155 people. 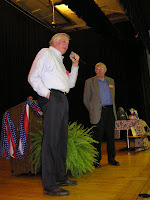 Lafayette County Republicans welcomed several statewide candidates and other dignitaries to the event. Special guests included: Senator Mike Gibbons, president pro tem of the Missouri Senate and candidate for Attorney General; State Treasurer, Sarah Steelman, candidate for Governor; Renee Hulshof, wife of Kenny Hulshof, candidate for Governor; Senator Brad Lager, candidate for State Treasurer; Brock Olivo, candidate for the U.S. 9th Congressional District; Senator Bill Stouffer, R-Napton; Rep. Mike McGhee, R-Odessa; Rep. Stanley Cox, R-Sedalia; and Rep. Gary Dusenberg, R-Blue Springs. Rep. Jason Brown, R-Platte City, was the keynote speaker. 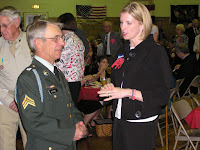 He is a decorated Iraq war veteran who was wounded while serving in public office. He still carries a bullet in his left lung. Representative Brown gave an inspirational account of his active duty and what it is like to serve in Iraq. Harland Mieser, southern commissioner, was honored for his 16 years of service to the county. Linda Niendick, county clerk, introduced Jim Strodtman, presiding commissioner who saluted Mieser for his service. The Rev. Paul Mehl gave the invocation. Tracy Dyer, candidate for southern commissioner sang the national anthem, and Barb Copenhaver, candidate for public administrator led the group in the Pledge of Allegiance. The Concordia Honor Guard presented the colors. 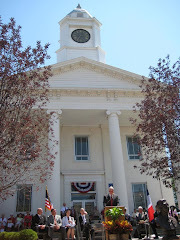 Chris Roepe, Alma native and chief of staff for Senator Charlie Shields, R-St. Joseph, was the master of ceremonies. Matt Michelson, legislative aide to Senator Stouffer was the auctioneer. In addition to the live auction, a silent auction was held. Lisa Paul and Rebecca and Mark Nierman sang during the reception before the dinner. The caterer for the evening was All Things Catered of Concordia, and ABS Auto Sound of Higginsville provided the sound.